While it is hard to get a straight answer from an American politician, they do have the freedom to speak their mind and say whatever they darn well want to. They may often put their foot in their mouth with exaggerations — “I invented the internet” — or say something they regret later — “you lie” — but they have the freedom to say whatever they want. That isn’t true in China. Every publicly-uttered syllable that comes out of a Chinese politician or military leader’s mouth is carefully crafted and consistent with the Communist Party’s objectives and philosophy. Television and newspaper comments are usually designed to gauge and influence public sentiment. Say something that contradicts and — God forbid — undermines the Party’s objectives, and you’ll find yourself out of a job and perhaps even serving hard time in a Chinese prison. I pay careful attention to the economic comments of China’s leaders because it usually contains a clear road map of where the Chinese economy is headed as well as helping me find the next great investment idea. Unlike American politicians that have to deal with a two-party system and constituents, whatever the top Chinese leaders want … they get. Some of China’s most powerful leaders had a lot to say last week and buried in every one of those comments was some actionable advice that you can make money on. Follow the Leader #1: The National People’s Congress, Chinese legislature branch, convened its annual planning session last Friday with a message from Premier Wen Jiabao. Wen gave a lengthy speech to the 3,000 delegates from around the country that outlined China’s economic and social priorities for 2010. The two key priorities are to maintain economic growth and increasing rural spending to help narrow the income gap between the prosperous coastal cities and the poor rural interior. Wen called 2009 a difficult year for the Chinese economy because of the global economic crisis. Despite that, China saw a strong economic growth rate last year of 8.7% and said he is targeting an economic growth rate this year of 8%. 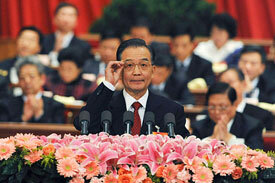 Premier Wen Jiabao is targeting an 8% growth rate for China’s economy in 2010. Su Ning, a central deputy governor, was even more optimistic. He forecast that China’s economy, will top last year’s 8.7% growth in 2010. “China’s economy will perform better than last year,” SU said. Investment Opportunity: The Chinese economy and the Chinese stock market will continue to hum. Everybody knows that stock prices follow corporate profits, but the key to rising corporate profits is a healthy, growing economy. The Chinese Premier just gave you the “green light” to stay bullish on China and the fastest way to do so is with a China-focused ETF such as the FTSE/Xinhua China 25 Index, symbol FXI. Follow the Leader #2: One of China central bank governors, Zhou Xiaochuan, said China would eventually move away from its current exchange rate policies, which he described as a temporary response to the global financial crisis, but he gave no timetable. “We don’t rule out that during some special periods — such as the Asian Financial crisis and the global financial crisis this time — we adopted special policies, including a special exchange rate mechanism. Sooner or later, we will exit the policies,” said Zhou. That is a monumental change from the previous, consistent stance of stressing currency stability and rejection of foreign pressure (mainly from the U.S.) to allow the Chinese yuan to strengthen. Investment Opportunity: A Chinese currency ETF will prosper from this change. There are two: (1) Morgan Stanley Market Vectors Renminbi (CNY) and (2) WisdomTree Dreyfus Chinese Yuan (CYB). Follow the Leader #3: There is no shortage of China critics and most of them cite the hot real estate market as a bubble waiting to be burst. Real estate markets, China or otherwise, thrive or die on the availability of credit. China’s leaders are making sure that access to credit won’t be a problem in 2010. China’s central bank plans on increasing the broad money supply by 17% for this year. “If M2 (the broad measure of money supply) growth is 2 to 3 percentage points higher than the combined growth of GDP and CPI, the monetary policy could be seen as easy,” said Su Ning of the central bank. Investment Opportunity: There are several Chinese real estate stocks listed in the U.S., such as E-House (EJ) and Claymore/Alphas Shares Real Estate ETF, but I think the biggest winner could be China Housing & Land, symbol CHLN. To be fair, I must disclose that my Asia Stock Alert subscribers already own this winner. Follow the Leader #4: China currently has about 3,300 kilometers of high-speed railways, but it plans to expand the network to 13,000 kilometers by 2012. As part of last year’s US$585 billion economic stimulus package, China invested $88 billion in railway construction last year, but plans to spend another $120 billion in 2010. China plans to expand its high-speed railway system. “The massive investment in railway construction last year fueled the demand for 20 million tons of steel and 120 million tons of cement,” said the Ministry of Railways official. Investment Opportunity: China Railway Construction, symbol 1186.HK or CWYCF.PK, will be a big winner as well as steel and cement companies, like Anhui Conch Cement, symbol 0194.HK or AHCHY.PK. Both are traded on the Hong Kong Stock Exchange and the U.S. over-the-counter bulletin board. Again, Asia Stock Alert subscribers already own both of these stocks. Hansel and Gretel left a trail of breadcrumbs to find their way back home and China’s most influential leaders left you a trail of breadcrumbs for investment profits. Of course, timing is everything so I suggest you wait for these stocks to go on sale as well as doing your own due diligence to make sure these securities are appropriate for your situation. But make no mistake about it, the combination of (a) rapidly growing economy, (b) $2.3 trillion of cash, and (c) the communist command economy ensures that China’s leaders are going to get what they want and riding on their coattails could be a very profitable walk through the investment woods.